The VersaFrame system is an entire collection of products designed to eliminate frustration and make advanced designs available to all teams. By utilizing modular, low-cost construction components, teams can build almost anything they can think of - and they can do it with only a drill and a wrench. When VersaFrame was first introduced, it consisted of aluminum tubing and gussets that were pre-drilled on a 1" pitch. By taking design cues from the popular VEX EDR and VEX IQ construction systems, VersaFrame allowed teams to quickly move a design from concept to reality without being hindered by precision manufacturing constraints. Teams could focus on the core of the engineering design process - not the finer details of how to use expensive machinery. For experienced teams with plenty of resources, this meant quicker prototyping and concept realization. For teams without access to advanced resources, this meant a chance to create sophisticated mechanisms at a fraction of the cost. Since then, VersaFrame has transcended its initial role as a "set of gussets and tubes". It has become an entire design methodology; a cohesive family of products that work together in simple, intuitive ways to help all teams achieve superior performance. The VersaFrame system is an entire collection of products designed to eliminate frustration and make advanced designs available to all teams. By utilizing modular, low-cost construction components, teams can build almost anything they can think of - and they can do it with only a drill and a wrench. When VersaFrame was first introduced, it consisted of aluminum tubing and gussets that were pre-drilled on a 1" pitch. By taking design cues from the popular VEX EDR and VEX IQ construction systems, VersaFrame allowed teams to quickly move a design from concept to reality without being hindered by precision manufacturing constraints. Teams could focus on the core of the engineering design process - not the finer details of how to use expensive machinery. For experienced teams with plenty of resources, this meant quicker prototyping and concept realization. For teams without access to advanced resources, this meant a chance to create sophisticated mechanisms at a fraction of the cost. Since then, VersaFrame has transcended its initial role as a "set of gussets and tubes". It has become an entire design methodology; a cohesive family of products that work together in simple, intuitive ways to help all teams achieve superior performance. Pre-drilled aluminum stock in a variety of sizes and styles, with thicknesses chosen specifically for a perfect balance between strength and weight. An assortment of commonly used pre-drilled angle gussets and pre-made motor mounts that aid in mechanical design using VersaFrame Stock. 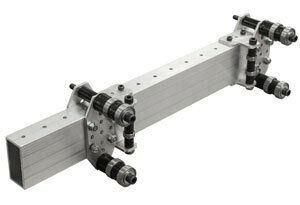 Built to achieve versatility through simplicity, this gearbox creates an efficient one-motor-per-wheel drivetrain by clamping onto a 1" x 2" VersaFrame Tube Stock. 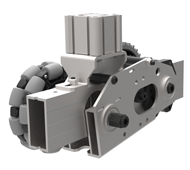 A revolutionary easy-to-assemble drivetrain that can be built using nothing but a saw and a drill. 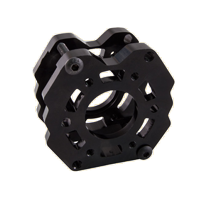 Bearing blocks designed to help make a popular "West Coast Drive" simple and accessible. Pre-drilled gussets and mounts that aid in the design of a linear elevator. 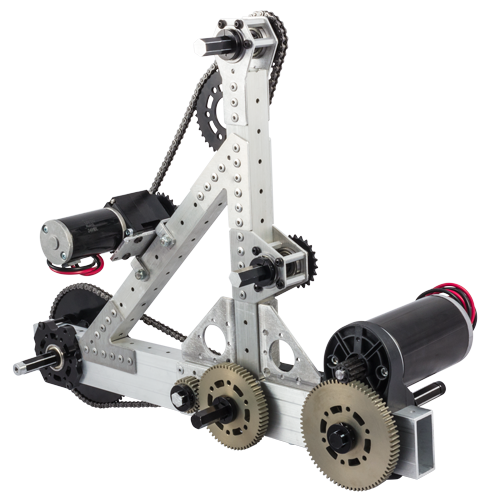 A series of robust chassis systems created for the new year's game immediately after the FRC kickoff.